Slice the onion and the tomato.Preheat the oven to 180°C (Gas mark 6). Lightly toast the slices of bread and rub them with the garlic. 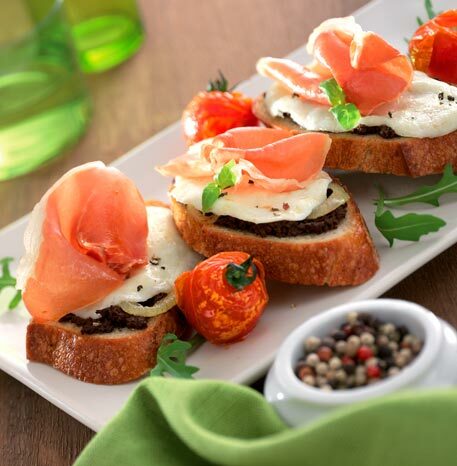 Spread them with tapenade then add some thinly sliced mozzarella, three or four slices of tomato, three or four slices of onion and a slice of Bayonne Ham. Finely chop the chives and basil, sprinkle over the top, adding a twist of pepper. Put the bread in the oven for five minutes to heat through lightly.